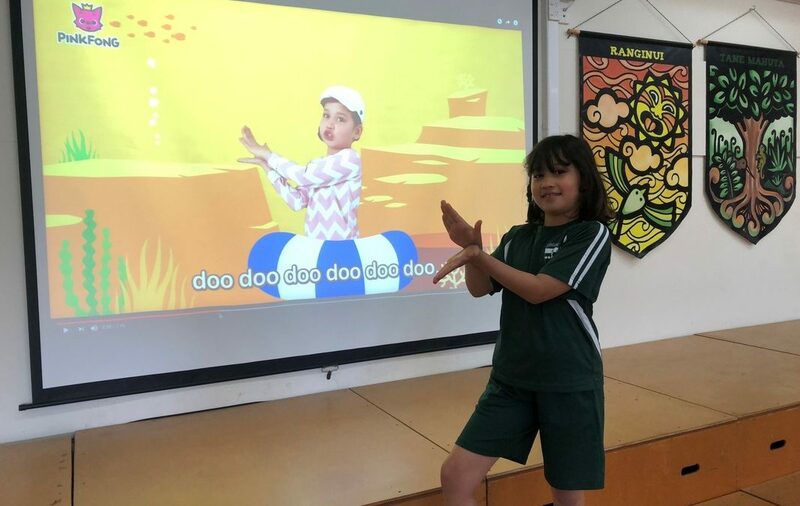 The star at the centre of the ‘Baby Shark’ video with 1.7 billion views on You Tube has been staying under the radar right here in Masterton. When nine-year-old Elaine Kim Johnston moved to Masterton from Korea last November, she didn’t think the video she starred in two years ago would be something people would care about. The ‘Baby Shark’ video produced by Pinkfong was initially released in Korea, but Elaine had no idea it would get almost 2 billion views worldwide. Her mum, Hee Jung ‘Lisa’ Kim Johnston said Elaine had already been successfully modelling in Korea since age four which was why she was contacted to audition for the video. “I think she’s quite unco [uncoordinated] but she’s got the energy which is why I think they liked her,” Lisa said, laughing. Elaine had to practice the moves for ‘Baby Shark’ as well as the ‘Penguin Dance’ which has also been successful, having received 18 million views on YouTube. “In Korea it was quite big when we had just done it and then a year later it became big in Indonesia,” Lisa said. They were soon given news the video had spread as far as the Philippines, Thailand, Italy and then the United States. At first, no-one in Wairarapa knew Elaine was the girl in the video, but then her dad let the cat out of the bag by telling a friend who knew children at her school, St Patrick’s School. Elaine’s friends were excited when they heard the news, especially her best friend Vyolet Banner, who was among those who already knew the dance in the video. “At first they said it was ‘cool’ and then they tried to do it and I had to judge who was better,” Elaine said. She was a good sport when her friends “begged” her to perform the dance, with Elaine saying her St Patrick’s School friends were her favourite part about living in Masterton. “And my nana,” she added. In fact, her nana Helen Johnston, used to be principal of St Patrick’s School, giving Elaine a special link to the region. Although Elaine has left her former modelling life behind in Korea, she was keen to pick it up again in New Zealand and was hoping her ‘Baby Shark’ fame would help.